HBO Films’ CONFIRMATION stars Kerry Washington (Emmy® and Golden Globe nominee for “Scandal”; “Django Unchained,” “Ray”), Wendell Pierce (HBO’s “Treme” and “The Wire”), Greg Kinnear (Oscar® and Golden Globe nominee for “As Good as It Gets”; “Little Miss Sunshine”), Jeffrey Wright (Emmy® and Golden Globe winner for HBO’s “Angels in America”; HBO’s “Boardwalk Empire”), Eric Stonestreet (Emmy® winner for “Modern Family”) and Jennifer Hudson (Oscar® winner for “Dreamgirls”). Written by Susannah Grant (Oscar® nominee for “Erin Brockovich”) and directed by Rick Famuyiwa (“Dope,” “The Wood”), the film details the explosive 1991 Clarence Thomas Supreme Court nomination hearings, which brought the country to a standstill and forever changed the way we think about sexual harassment, victims’ rights and modern-day race relations. CONFIRMATION is executive produced by Michael London (“Trumbo,” Oscar® nominee for “Sideways”), Janice Williams (“Trumbo,” “The Astronaut Wives Club”), Kerry Washington and Susannah Grant. Darren Demetre (“The Bling Ring”) is the producer. The HBO Films presentation of a Groundswell Production in association with ABC Signature Studios debuts in April, exclusively on HBO. The film also stars (in alphabetical order): Dylan Baker (“Selma”), Erika Christensen (“Traffic”), Kimberly Elise (“Diary of a Mad Black Woman”), Malcolm Gets (“Caroline in the City”), Grace Gummer (HBO’s “The Newsroom”), Bill Irwin (“Interstellar”), Zoe Lister-Jones (“Salt”), Peter McRobbie (“Lincoln”), Treat Williams (“Everwood”) and Alison Wright (“The Americans”). CONFIRMATION looks behind the curtain of Washington politics, depicting a pivotal moment in American culture that became a turning point in workplace equality and gender politics. 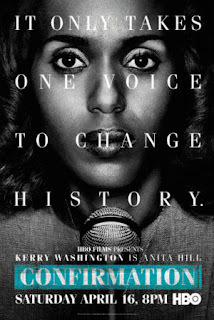 Kerry Washington portrays law professor Anita Hill, who accused Supreme Court nominee Clarence Thomas of sexual harassment, with Wendell Pierce as Judge Thomas and Greg Kinnear as Democratic Senator Joe Biden, who presided over the hearings as chairman of the Senate Judiciary Committee. Jeffrey Wright plays Harvard law professor Charles Ogletree, Professor Hill’s lead attorney during the hearings, and Eric Stonestreet portrays Ken Duberstein, a Washington lobbyist hired by President George H. W. Bush to promote Judge Thomas’ confirmation. Jennifer Hudson portrays Angela Wright, another Thomas accuser, who was subpoenaed but was never called to testify before the Judiciary Committee. Dylan Baker plays Republican Senator Orrin Hatch. Erika Christensen plays Shirley Wiegand, Hill’s close friend. Kimberly Elise plays Sonia Jarvis, a civil rights attorney on Anita Hill’s legal team. Malcolm Gets plays Republican Senator Arlen Specter. Grace Gummer plays Ricki Seidman, aide to Senator Edward Kennedy. Zoe Lister-Jones portrays Carolyn Hart, an aide to Senator Biden. Peter McRobbie portrays Republican Senator Alan Simpson. Treat Williams plays Democratic Senator Edward Kennedy. Alison Wright portrays Ginni Thomas, Thomas’ wife. The behind-the-scenes team includes director of photography Rachel Morrison; editor Dirk Westervelt; production designer Stephen Altman; composer Harry Gregson-Williams; costume designer Hope Hanafin; and casting directors Kerry Barden and Paul Schnee.